Building a home, or even remodeling a home, is a large task with many decisions to make. One of these decisions is the choice between old-fashioned insulation and foam insulation. Many homes use the old style of insulation, with good results. But many times it is not the optimum solution. Foam insulation is a more modern way, with several advantages including efficiency, easy to install and lower lifetime cost. In the following paragraphs, we will expand upon the advantages of foam insulation. Foam insulating material has the advantage of being very efficient over traditional insulation. The material is successful at keeping heat at bay by stopping more heat from getting into the house. Not only does it stop more heat from entering the home, it also regulates the temperature inside the home by not allowing the heated or cooled air to escape. The reason for this is because foam insulation has a very high R-value versus traditional insulation. Briefly, R-value is a measure of protection insulation can provide against temperature conditions versus space. So having a higher R-value, such as foam insulation, provides a much more efficient way of insulating your home. 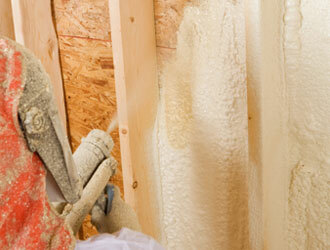 Installing foam insulation also has the advantage of being very quick to install, especially in existing homes. The thought of updating current installation, including removing drywall, floors and getting into other tight areas, seems daunting. But foam insulation makes the job a lot easier and with fewer headaches. It can be installed within existing walls and other areas without the need of total access. The foam insulation is sprayed into the various areas by creating small openings, and then the foam expands to fill the entire area. Cost is a big consideration in any home building or remodeling task. One might be hesitant to choose foam insulation due to the fact that it has a bigger ticket price. But the true cost to install foam insulation is what one must consider when deciding between the two types. Foam insulation, it might surprise you, has a lower overall cost in many installations. Consider the fact that in a remodel situation, one would have to spend additional money for the time and labor of removing drywall and floors to get to the old insulation. Foam insulation, as was already mentioned, doesn't need a complete removal to gain access, making the time and labor less. Additionally, foam insulation is much more energy efficient, which will make your energy bill much less for years to come. The advantages of foam insulation over traditional insulation make it a wise choice for remodeling a home or new construction. It is a much more efficient way of insulating your home, it is a much faster way of installing, and offers a total cost that is much less than traditional insulation. If you considering installing insulation in a new or existing home, foam insulation is an optimum solution. Modern Building Sciences and Energy Efficient Green Building Initiatives Read all about how spray foam used in the Building Envelope outperforms fiberglass insulation, becomes a superior air abrrier, and defies traditional, and perhaps, outdated building practices of attic and crawl space ventilation. Spray foam insulation saves on energy costs and lowers utility bills. SPF is used to seal the entire "building envelope" of your home to prevent air and moisture infiltration. The US Department of Energy (DOE) studies show that 40% of your home's energy is lost due to air infiltration. This air infiltrates the home in the form of drafts through walls sockets, windows and doorways. Foam insulation has an aged R-value of approximately 6.0 per 1 inch thickness (depending on the particular formulation and application, higher values have been achieved), enabling it to provide more thermal resistance with less material than any other type of commercial insulation material. Foam insulation are frequently used to insulate and protect a wide variety of residential, commercial, and industrial buildings. Studies have shown that as much as 40% of a building's total energy loss is due to air infiltration. Traditional fiberglass insulation is only stapled, or placed into the wall cavities and does not seal the stud and wall cavities from end to end, or top to bottom. Air infiltration can pass through these gaps, making it far less efficient than foam insulation. Foam insulation not only adheres to, but forms to the walls and floors to create a tight seal and insulating barrier that stops this air leakage. Foam insulation also boasts the highest R-value per inch than any other commercial material, (upwards of R-7.0, compared with Fiberglass at R-3.5) making your home more comfortable and less expensive to heat in the winter, and cool in the summer. Molds produce tiny spores to reproduce. Mold spores waft through the indoor and outdoor air continually. When mold spores land on a damp spot indoors, they may begin growing and digesting whatever they are growing on in order to survive. There are molds that can grow on wood, paper, carpet, and foods. When excessive moisture or water accumulates indoors, mold growth will often occur, particularly if the moisture problem remains undiscovered or un-addressed. There is no practical way to eliminate all mold and mold spores in the indoor environment; the way to control indoor mold growth is to control moisture. Foam insulation is the key. Before making a decision on foam insulation, make sure to read our article describing the types of foam insulation to better educate yourself on the options available.